It’s very early spring and you walk out to your rhubarb patch for the first time since last Fall and gasp: Your rhubarb has already bolted. #1 Don’t panic. #2 Don’t throw in the towel on your rhubarb. #3 Everything’s going to be just fine. In fact, discovering rhubarb seed pods and rhubarb flower stalks is perfectly normal. What Causes Rhubarb To Bolt? 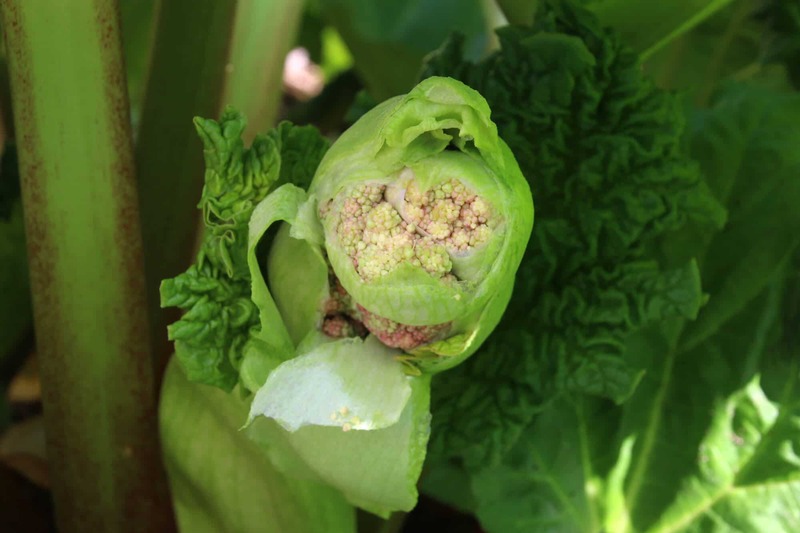 There are a few reasons why your rhubarb plants may be bolting: Seed pods and flower stalks usually don’t grow on younger rhubarb plants but they are common on more mature plants that are at least 3 years old. Our rhubarb plants have been tended by one home owner after the other for the past 100 years! And we get several flower stalks per rhubarb plant. Dividing the crowns of mature plants every few years resets the maturity clock so to speak and reduces flowering. 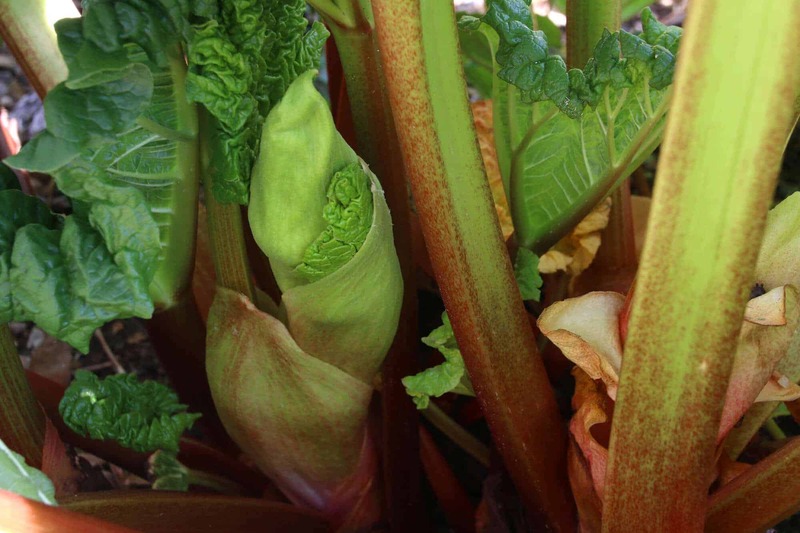 Another factor that influences the growth of flower stalks is the variety of rhubarb. Some are more likely to flower than others. Old-fashioned varieties such as Victoria and MacDonald continuously produce seed pods whereas other varieties like Canada Red and Valentine are less likely to bolt. These and other modern varieties are bred to flower less often. Heat can also cause rhubarb to bolt. 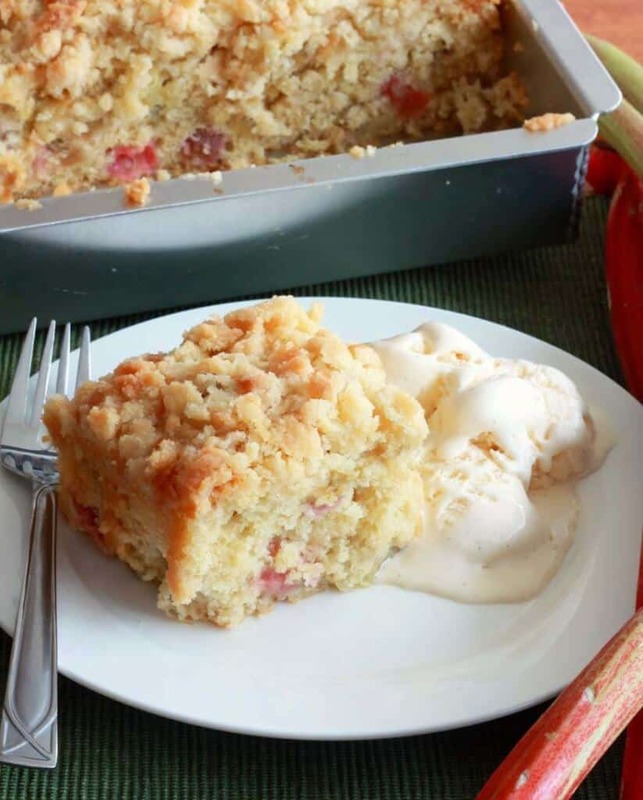 Rhubarb does best in cool weather and if you’re having a particularly warm Spring it can cause the rhubarb to bolt. Be sure to give your rhubarb plant adequate water. 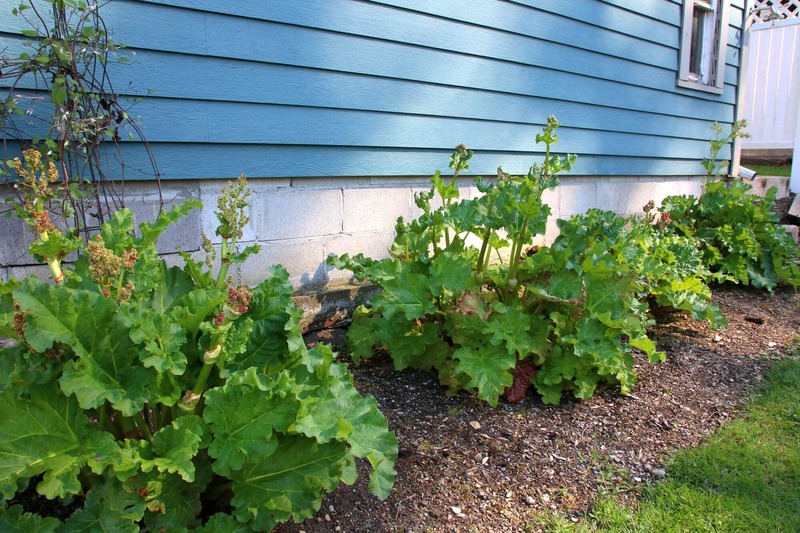 Other stressors can also cause rhubarb to bolt, such as insect or animal damage to the leaves or a lack of nutrients. Still, even when all proper care and precautions are taken, it’s very natural for rhubarb plants to bolt. 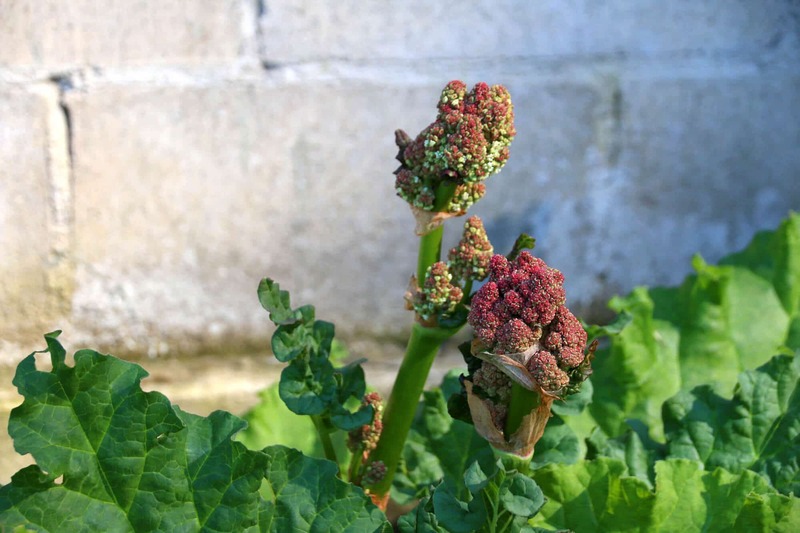 What Do I Do When My Rhubarb Has Bolted? Rhubarb flowers are pretty and it’s almost a shame to cut them down. Do you have to? No, they won’t actually harm the plant. Nor will they affect the flavor of the rhubarb. But they will greatly limit your harvest. The simple reason is that it takes a plant a lot of energy to produce flowers and seeds and that is energy is being diverted from producing the actual edible stalks. A rhubarb plant that is allowed to go to seed won’t yield as large of a harvest as it otherwise would have. Ideally you really want to avoid letting your rhubarb plant even get to the point where there are flower stalks. Initially these long shoots start off as a seed pod at the base of the plant. As soon as you notice these seed pods remove them. To remove them use a sharp knife at cut them as close to the base of the plant as possible. If they’re not removed the seeds pods will grow into a long stalk and flower at the top, diverting even more energy away from the production of edible stalks. Remove these flower stalks by cutting them with a sharp, clean knife as close to the base of the plant as possible. Flower stalks are harder to remove than regular stalks are by twisting and pulling so you’ll most likely need to use a knife to cut them. I’ve heard the flower stalks are edible but remove and discard the flowers and leaves. Rhubarb flowers last a long time. Try putting them in a vase for a more exotic flower arrangement. 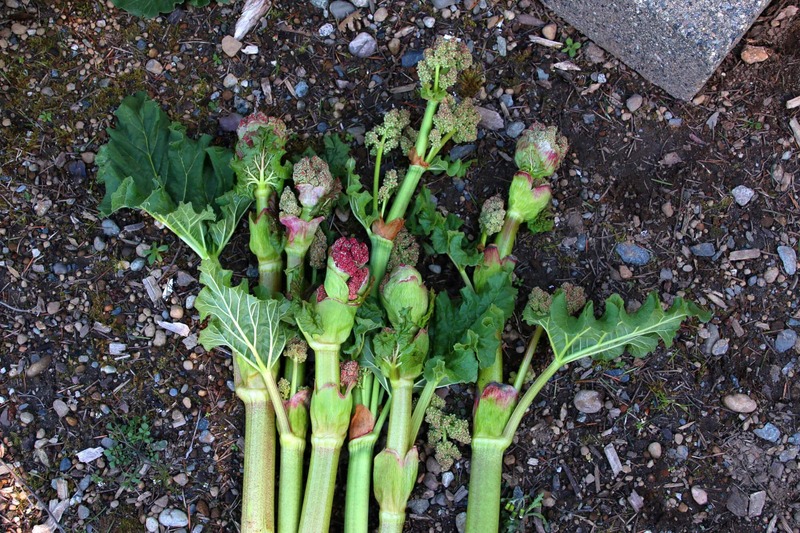 With your seed pods and flower stalks removed your rhubarb plant can now focus its energy and producing a delicious and healthy yield of edible rhubarb stalks. Continue checking your plant frequently for new seeds pods and promptly remove them. Ready to eat some rhubarb? Check out these yummy recipes! I envy you Kim.. I always dream have a house with a yard so I can really plant something, I mean not on pots. What a great post about gardening. Thank you for sharing it. I understand your wish Citra. But at least you can enjoy rhubarb in a pot. i started with one and then divided it into 2 and both produce regulalry with regular feeding. Whilst you dream of a yard it can become a nightmare and needs a lot more upkeep than a set of patio pots. Yes it was a very useful post. Best to you. That is definitely true, Robin! Rhubarb is a prolific producer and maintaining it in patio pots is a great idea. I love rhubarb but never knew about the whole flowering after. Thanks for all of the information! I always have a problem with plants bolting! This will be helpful if we decided to plant rhubarb in the next few years! Thank you for the information about rhubarb flowering. Last year I let the flower remain and the plant soon died. This year I replanted and had another flower spike which I have now removed. A big feed and more vigilance would seem to be the way to go in future! Terrific, Lesley, thanks for reading and for letting us know about your success! Am I the last person to notice the Rhubarb leaf is a very efficient inverted umbrella, and the stalk is concave so a very efficient channel. This tells me the plant is not only a greedy consumer of fertilizer but likes water. If not watched, the soil under the leaves gets dry. That’s a good observation, David. Yes, they are very heavy feeders. I have one Victoria plant, after having a different variety for many years that only bloomed after 10 years, this has been a surprise. The Victoria bloomed after the first year I planted it. My question is, if I plant a different species do they coexist ok? Hi Sandy, we have two different types within a few feet of each other and they’ve done perfectly well, so at least from my own experience I would think they can coexist just fine. Can these seed pods be harvested for planting? That’s a great question, Sharon, and I haven’t been able to find any information about it. Generally when you grow rhubarb from seed the seeds will come dry and soak them for a few hours before planting. They’ll generally germinate after 10 days in a room that’s at least 70 degrees F. It’s definitely worth a try using the fresh seeds from the seed pods. Let us know if you have any luck! You’re welcome, Fred, and that rhubarb-raspberry pie sounds heavenly! Hello Fred, my name is Alex. May I just say that your Rhubarb and Raspberry pie sounds very interesting and delicious. Can’t say that I have ever heard of anyone I know ever making that combination. 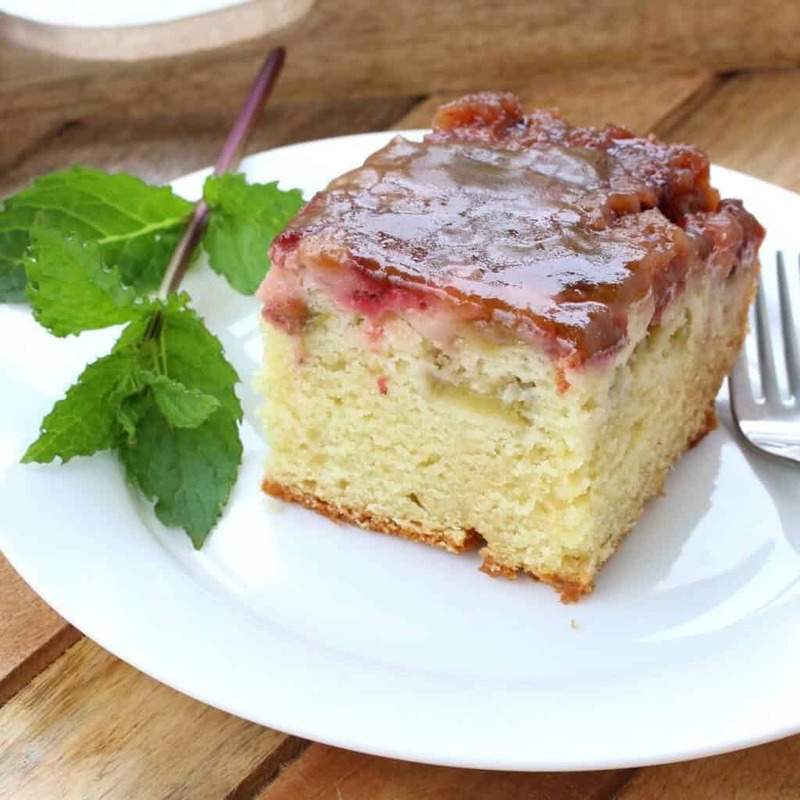 The norm from where I come from over here in NZ, as far as I know is Rhubarb and Apple pie, any chance you would be willing to share your recipe please good sir? It would be most appreciated I assure you!! P.S. I’ve got some apples ripening on my trees. I’m going to have to try that apple-rhubarb combination. Thanks for the tip. I planted two new plants last year. Both did very good and I didn’t harvest any stalks. We had a very warm spring SE South Dakota. Now both plants are flowering. One is advanced to the point stalks are 2’+. If I understand the info, I should cut this all out. Correct? Hi Todd, the flowering stalks are 2′? If there’s a flower bud on the end of the stalk, yes, remove it. Any time there are flowers growing it diverts energy and growth away from the edible stalks to the flowers and you’ll want to remove them as soon as you see them beginning to grow. We live in SE Mn and have never had any of our rhubarb bolt until this year. Walked out after we had snow to see how the plants faired and notice a very thick stalk, last week it was a couple of inches in diameter as well with a seed pod opening plus a few more starting. This was on a Canada Red. Cut it off. I had never had any luck in growing rhubarb, buying it and planting it year after year, only to watch it whither away until it was no more. My mom planted rhubarb and just ignored it and it grew waist high with thick stalks. Three years ago I planted some and watched it grow puny skinny stalks, turn yellow, and then it was gone, but the following spring it came back for the first time ever, so I decided to try chicken manure on one of my three plants and it grew better, bigger and greener with thicker stalks. This year I put manure on all the plants and they are doing much better but the biggest one has started to flower, which is why I came to this site. Thanks for the info. Hi, fortunately rhubarb is a pretty hardy plant and as long as the roots themselves weren’t disturbed it will probably be fine. Thank you for all the posting on this subject. I grew up eating rhubarb on my grandparents farm. I was finally able to get 2 plants from a local gardener a few years back. It was very difficult to find. I just found the flowers on my plant this year (about 3 years old). I hadn’t known rhubarb would flower. After reading the many posts, I have since cut and arranged the flowers along with my lilacs in a vase. It makes a lovely flower arrangement. I’m hoping the rhubarb continues to grow healthier. Wonderful, Tricia! Yes, removing those flowers will divert the energy back into growing the edible stalks. Thank you for posting this. I have rhubarb planted in two spots. One in my garden and one behind the house where it gets full (hot) sun. The one in the warmer spot flowers. 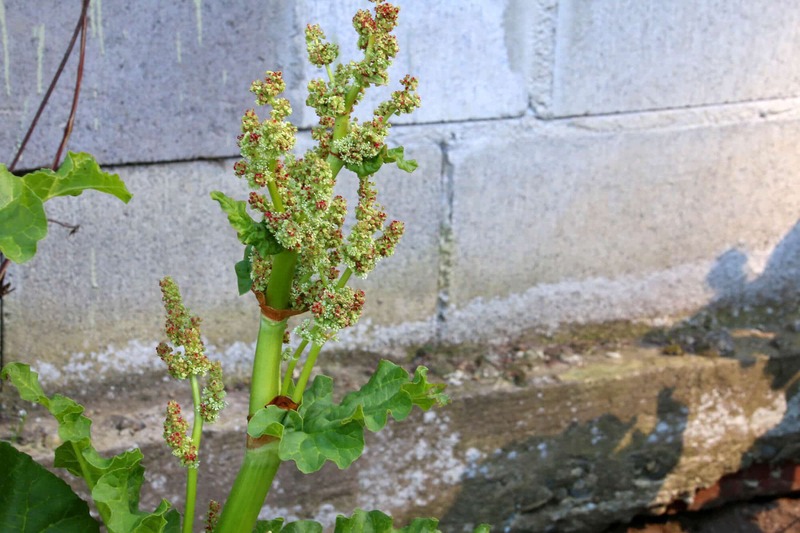 I was at a wedding and in a vase were long beautiful rhubarb stalks, so I kept those plants flowering and I wondered why that patch was not as thick as my garden. I make fresh rhubarb crisp every weekend. Can anyone recommend the best recipe for preserving rhubarb? Rhubarb crisp is probably my most favorite way to enjoy rhubarb :) I have a ton of rhubarb in my garden as well that I want to preserve long-term and am planning on working on a strawberry-rhubarb dessert sauce for canning. 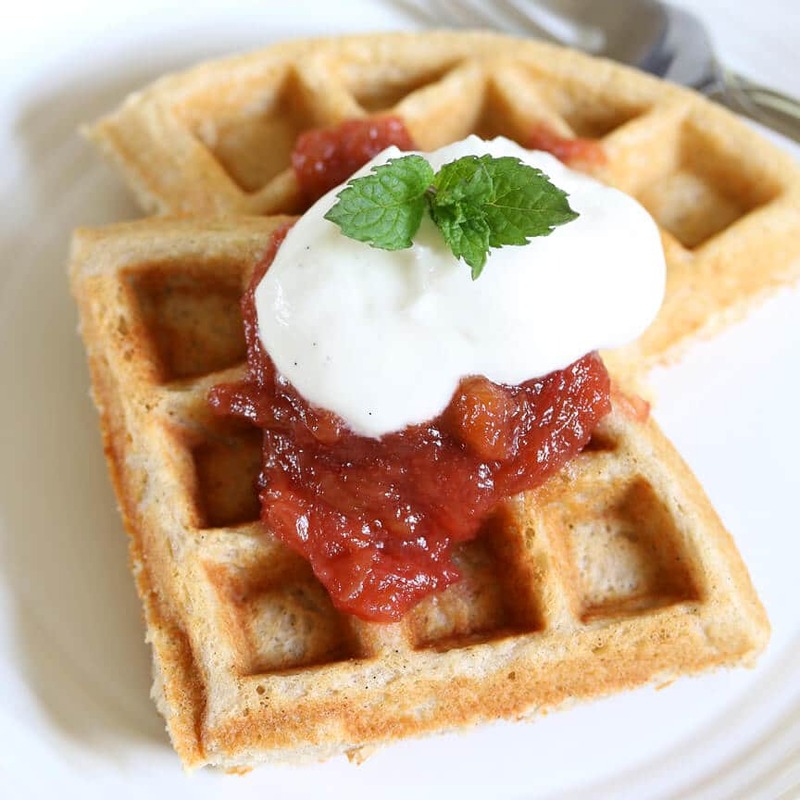 I also want to experiment with a rhubarb BBQ sauce. Thank you for the info. I went back to my childhood farm and found six large rhubarb plants all with 3 or more large flowering stalks that had dried and were dropping seed. I harvested much of the rhubarb but found that the rhubarb had no smell to it at all. Some had a little scent at the middle of the stalk but not near the leaf or root end. It did not have the typical sweet, sour scent I love. Any ideas? Not sure what it willl taste like if I use it or if it is unsafe somehow. I am not sure if it had been harvested the last couple years. Hi Shari, it’s perfectly safe, so that doesn’t need to be a concern. If it hasn’t been harvested the past couple of years the issue is likely that the crowns need to be split. 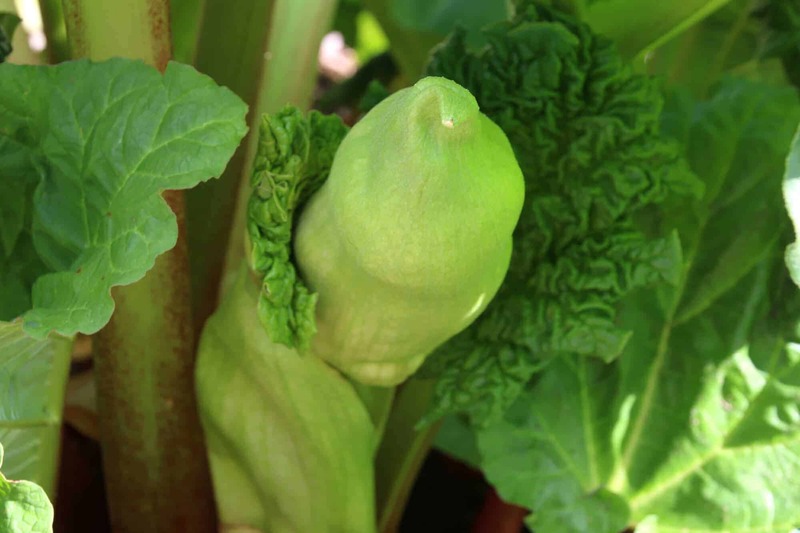 I’ve noticed with my own rhubarb that if I let them keep growing without splitting them and they become overcrowded as a result, the flavor and quality of the rhubarb is greatly compromised. The article refers to what are flower buds as seed pods. The plant has to flower before seed pods form. This was very helpful, I have a rhubarb that must be very old as it has been here since we moved in twenty years ago. I tried to dig it up as it was in a bad spot iand it kept on growing, I hacked it, have run over it with the lawn mower to no avail it has thrived its enourmous…I completely ignore it and gave away tons of it this year. I have a freezer full of it. Muffins, pies and cakes,compotes… sigh ..even after it bolts it keeps producing…its overtaken my small garden! Maybe I should pay attention to it and see if the opposite happens!! 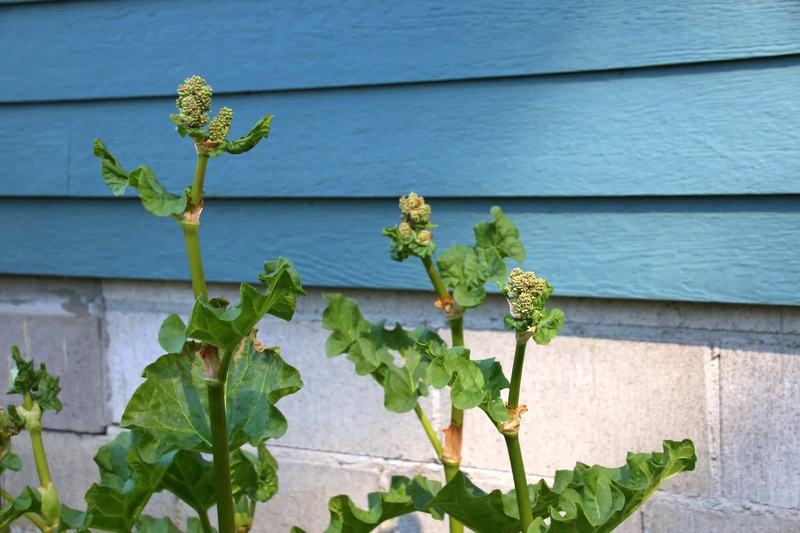 Why does burdock plants look so similar to rhubarb? Hi Linda, yes they do, especially when the burdock is young. They’re not related but they are commonly confused with each other. I have a slightly different rhubarb issue. I have some very tiny things Kant s that grew from seed. 2seedlings are in a smallish pot outside, and 2 more are planted directly in the ground. I’m wondering what your thoughts are on them surviving the summer and coming back in the spring. And, if there is anything special I should do to help them along. Thank you. Hi Simone, I don’t have any experience growing rhubarb from seed, only from roots when I split the crowns. I split and planted several this past spring – some in pots, some in the ground – and they are growing like crazy. I can’t speak for the seeds, but rhubarb is generally a very hardy plant that will thrive even against the odds. I live on the Central Coast north of Sydney and it is the middle of winter here. My rhubarb plant has gone to seed for the first time and I have collected some of the seed to see if I can grow it. After reading all the posts I will now cut the seed stalks off. Not sure why it is seeding as it isn’t warm, although we did have a hot summer especially February.But that was months ago so not relevant I think. Absolutely, Tammy! 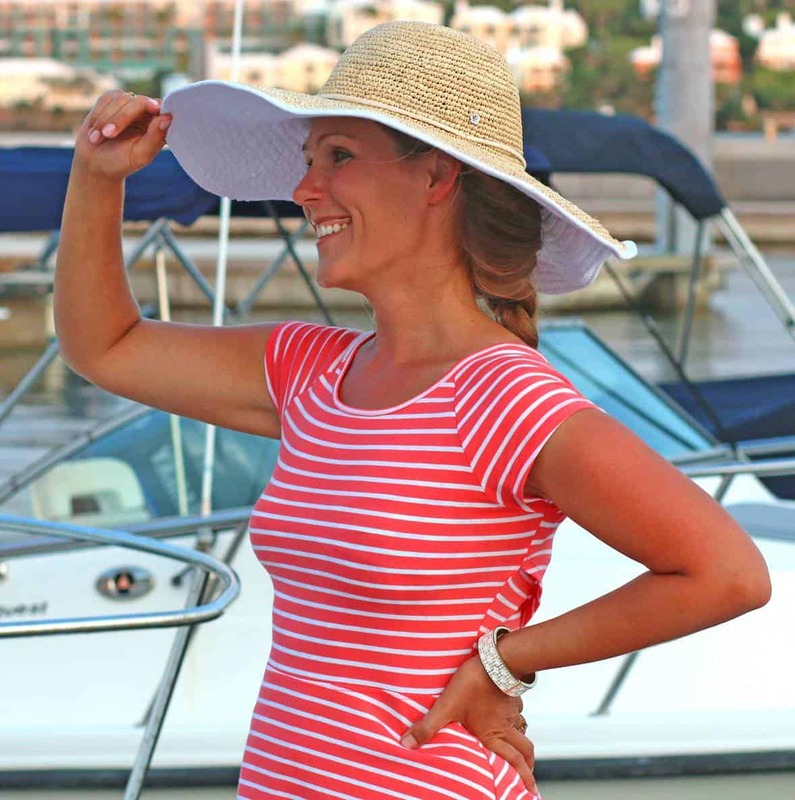 It’s perfectly safe, but the texture tends to wane over the course of the summer. I usually continue watering my rhubarb throughout the summer so that it extends its growing season. I have been leaving the flower stems on my rhubarb for many years and have not regretted it. I have a variety that is very early and produces huge leaves and stems something like gunnera. I think it is called something like Champagne Early but not sure. There are always more than enough non-flowering stems that I can eat and I’ve had plenty more to make wine from. The flower stems appear very early on. After three of four appear the plant seems to be satisfied with that. It’s like it says “thank you for letting me flower”! It keeps on producing edible non-flowering stems for the rest of the season while the flowers ripen to produce seed. The seeds turn a beautiful rustic red colour and I have successfully grown rhubarb from the seed and given a plant to a neighbour. So I don’t mind the flowers at all. We get along fine together! Your information about the Rhubarb seed pods was extremely helpful! My plants are only in their second year of growth, but one of them has developed a seed pod and I didn’t know enough to recognize the early pod. Thank you again! I’m so glad it was helpful, Vickie, thank you! Thanks for all the info. What type of feed to you give Rhubarb? I have some manure that I purchased when I first set my plants out, can I put some of this around the plant as food? Hi, manure is a good choice as is compost. We keep a compost pile and that’s what we mostly use for our rhubarb and veggies. Someone asked about ways to preserve rhubarb. In my opinion rhubarb and ginger jam is a wonderful contribution to breakfast (with fresh ginger, not ground). Make too much and you’ll have presents for your friends. I read in a homesteader type magazine that the flowers themselves could be processed in a manner where they could be eaten. That really is what I am looking for since I’ve never had any trouble growing rhubarb. I was given a recipe for making a rhubarb drink also using raspberry or strawberry Jell-O. Nice. My grandfather always had a large number of rhubarb plants in his garden because he was a home wine maker and favoured rhubarb wine. When he passed on, all his plants were dug up by the landlord. I managed to rescue about 10 of them from the dumpster, along with 2 gooseberry bushes. Sadly only 4 survived in the long run, along with only 1 of the gooseberry bushes. I have no idea of the variety, and I have no use for rhubarb, so I actually allow them to run to flower for decorative purposes. Can you eat (cook) the tube like part of the rhubarb?